The Bridesmaids star is nominated for her role as biographer turned forger Lee Israel in Can You Ever Forgive Me? while Grant plays her friend Jack Hock. 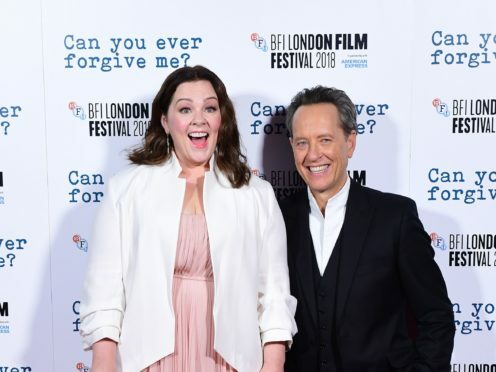 Congratulations to the #CanYouEverForgiveMe duo on their #SAGAwards nominations for Best Actress – @melissamccarthy and Best Supporting Actor – @richard.e.grant. McCarthy is nominated alongside Olivia Colman for The Favourite, Glenn Close for The Wife, Emily Blunt for Mary Poppins Returns as Lady Gaga for A Star Is Born. Close, who has already won the Golden Globe for her role as the spouse of a Nobel-prize winning author, said the film was like “the little movie that could”. She added she was wearing a ring that belonged to her grandmother, saying: “She wanted to be an actress and I only knew that after she died. Amy Adams, nominated for her roles in the film Vice and TV series Sharp Objects, said she felt “very blessed” to be honoured at the ceremony. Talking about her role in Sharp Objects as journalist Camille Preaker, she said that being a mother meant she couldn’t take the darkness of the character home with her. Mahershala Ali, who is nominated for best supporting actor for his role as pianist Dr Don Shirley, arrived at the awards in a maroon suit. He paid tribute to his co-star Viggo Mortensen, saying: “It started with him, the tone that he set, being the more experienced actor, the one who came on to the scene with more presence.